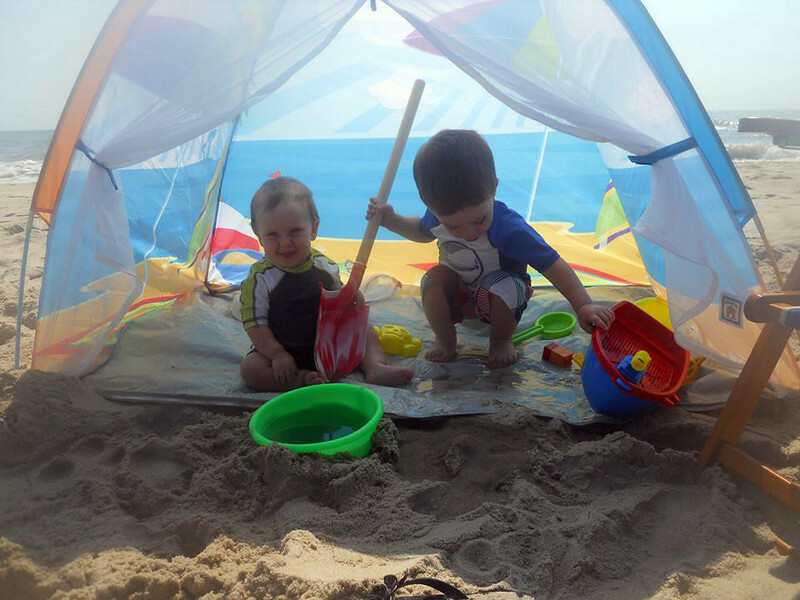 Tips for Taking your Little Ones to the Beach Mama Say What?! | Mama Say What?! This summer as a mama of two (a 29-month-old son and an eight-week-old daughter) I have become somewhat of a pro at taking my little ones to the beach. My in-laws recently bought a house near the ocean and our family has taken complete advantage of this amazing piece of property. I have found myself planning and packing for entire week long vacations or throwing things together for just a short weekend trip various times this summer. 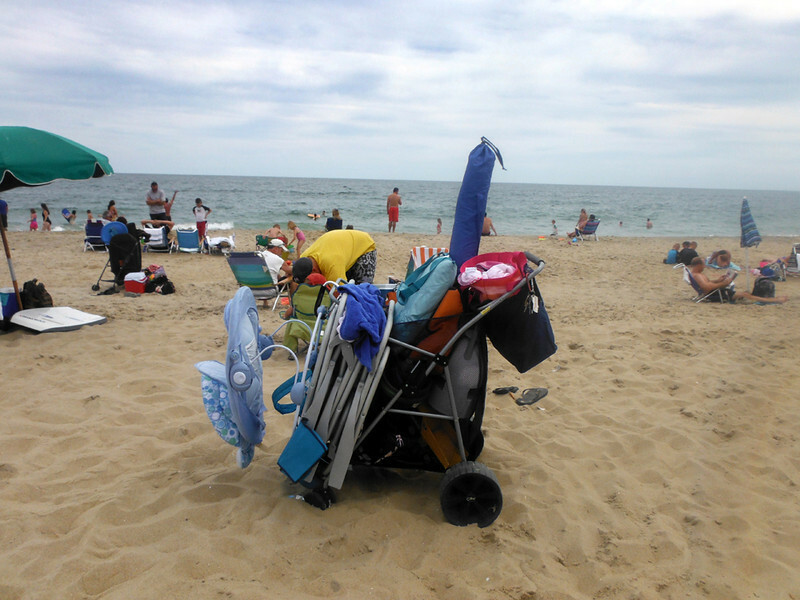 Get a good cart to lug all your stuff from the car to the beach. My husband has perfected this type of “pack mule-ing” as I so lovingly refer to it as, but the cart is the real steal deal. We got ours from Costco and it has been a Godsend. We have a Tommy Bahama brand (but there are tons of others out there which are essentially the same thing) and it has tons of storage for getting everything from your car straight onto the beach. This cart has wide wheels so it rolls easily on sand and other surfaces and has tons of storage for all your beach necessities. Make sure to get a good Umbrella for the littles to sit/lay under. We have a Super Brella and absolutely love it. 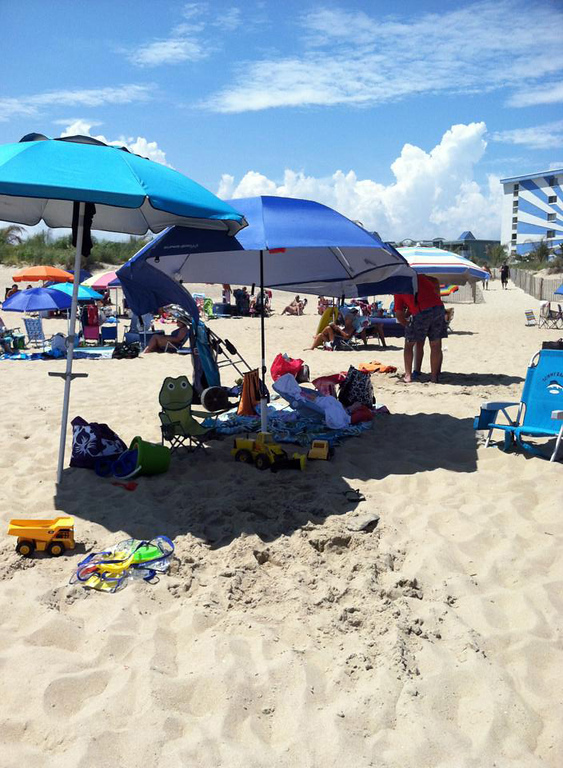 Your umbrella should have at LEAST a maximum sun protection UPF 50+ that protects over 99.5% of UVA and UVB rays. Take it from me, the first time I took my daughter to the beach (she was three weeks old), I had her under a normal beach umbrella. She was in the shade ALL day and my poor baby’s face still got completely sunburnt. It was awful and terrible and I don’t know when I will forgive myself for letting that happen to her, but we immediately went out and bought one of these Super Brellas and it has been a lifesaver. 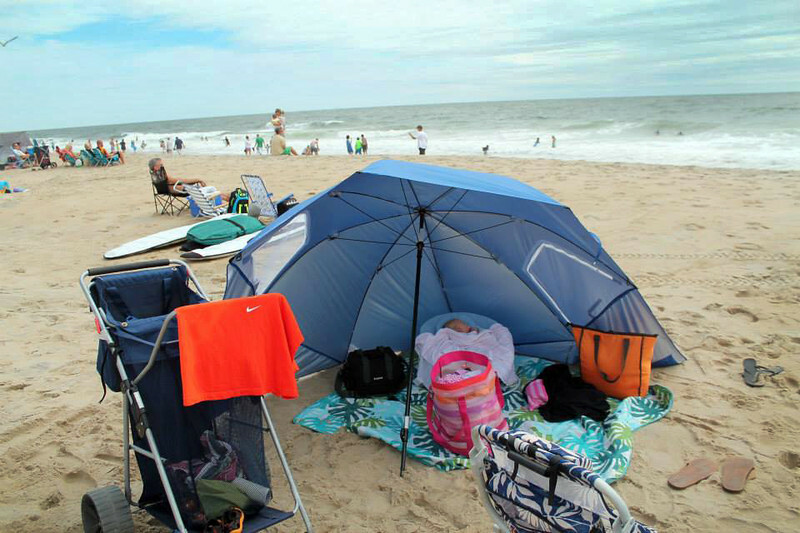 There are two different ways of setting this up and both options are great for a day on the beach although we prefer to stand it up like a regular umbrella as it allows a good breeze to come through. Make sure to pack easy-to-eat snacks and drinks. We do the Gerber pouches, Oscar Mayer Carver Chicken, cut up fruit, animal crackers and cookies, fruit snacks, etc. Toddlers get sand in more places you can count, so easy finger foods they can eat on the go are the best bet. Water and juice boxes are also a must. 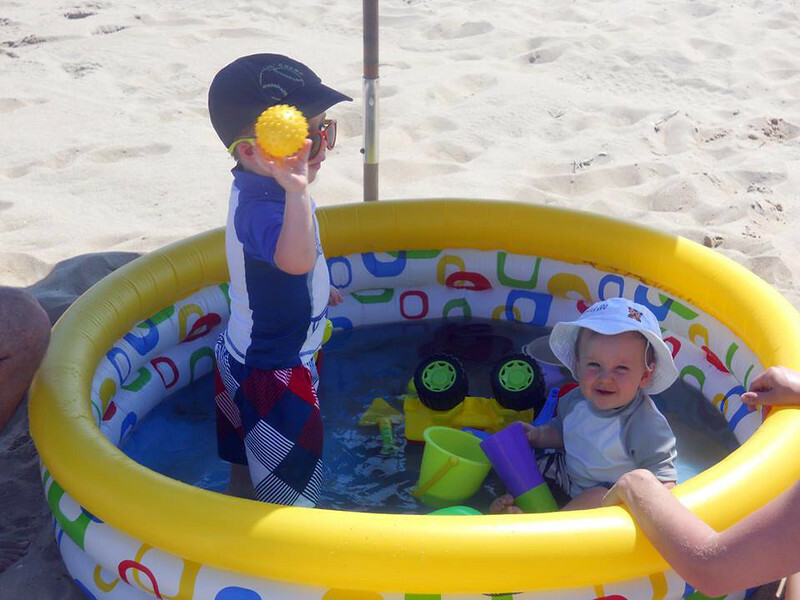 A blow up pool on the sand works wonders and keeps your littlest littles from sitting on the sand constantly. Its just another place for the littles to play, a change of scenery and is a place to cool down and chill out. Also another good tip is to invest in a 5-gallon bucket (makes filling the pool a lot easier and faster – fewer trips to the water). Sand toys are a must. You would think this is a “known fact” but some people seem to forget as we have had wandering kids manage to “borrow” our toys in the past. We have a ton of different buckets, shovels, trucks, balls etc. to play with and keep every kid entertained for the day. A space saver swing or bouncer for your infant to hang out in is another must. Most little babies sleep a LOT. Especially with the waves crashing in and the breeze on the beach…. having a place to put them in the shade is a huge help. A friend of mine actually suggested this to me and now we lug ours out every time. My daughter hangs out for hours completely content. Take two types of sunscreen. We have both the lotion kind that we apply before leaving the house and then we have the spray type which makes applying in the sand much easier. 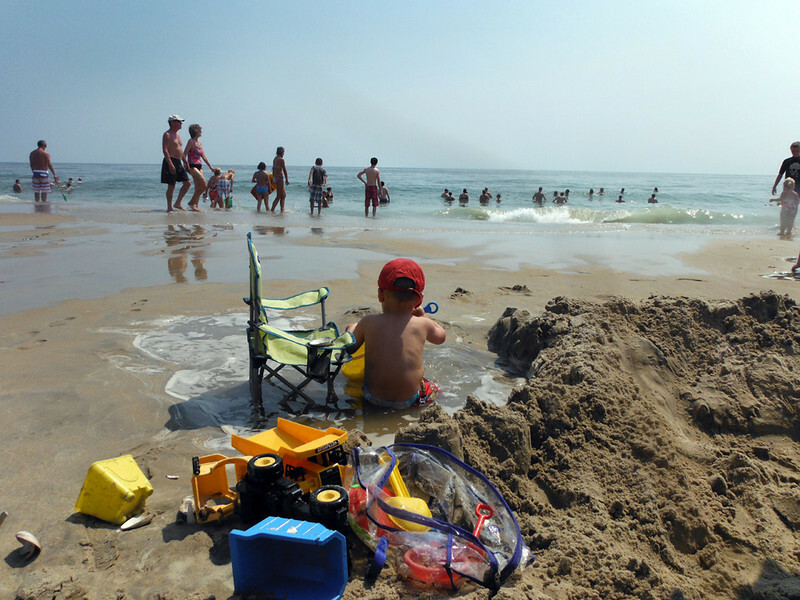 With little ones who get covered in sand, it’s quite difficult to reapply lotions multiple times a day. If you get them covered with a good coat of lotion before leaving your home or hotel, the spray is a must for on the beach reapplication. Water shoes. The sand gets VERY hot and for toddler’s feet it can be “catastrophic” to them if they step in the wrong place at the wrong time. Our son doesn’t wear his water shoes all day long but we make sure to have them just in case so he can walk and play where he wants. Water shoes are also very helpful when there are a lot of broken shells and debris closer to the water so your little can run and play as they desire. Get a good spot in the sand as close to the water as you can get — this allows you to get a good breeze under your umbrella and a prime viewing pleasure of your toddler who may be more adventurous playing in the water and sand, as well as a good sitting spot next to smaller children who need to remain in the shade. Also, the earlier you get on the beach, the fewer people you have to fight for a good spot. For nursing moms, I totally recommend a light weight blanket to cover with instead of a regular nursing cover. I use an aden + anais swaddle and it is so much cooler and lighter than my normal nursing cover which can get hot and heavy. I normally sit in my chair, prop the baby up with a towel or two, cover us both up to get her latched and then just sit holding the blanket so it shields her from both the sun and the masses of people. Most people don’t pay any attention to me whatsoever. Added by Melissa T. on September 10, 2013. I never thought about getting a cart we always try to carry it and make several and the blow up kiddie pool priceless thanks for the tips.